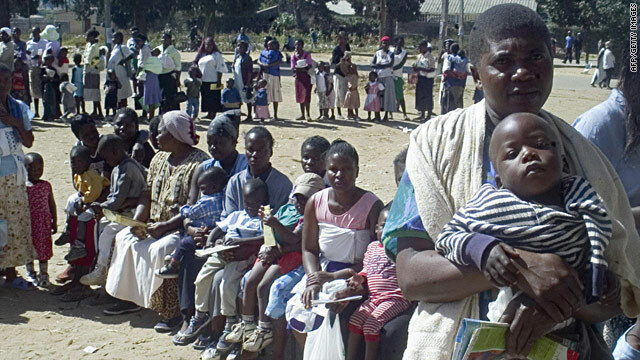 Women queue in June 2006 to have their children immunized against measles in Harare's poor suburb of Mabvuku. Harare, Zimbabwe (CNN) -- Twenty-two people, mainly children below the age of 5, have died of measles in Zimbabwe, the country's state media reported. The World Health Organization (WHO) said two weeks ago it was "deeply frustrated" by the measles outbreak, which came after it sponsored a vaccination program in the African nation. WHO's head in Zimbabwe, Dr. Custodia Mandlhate, told journalists in Harare the outbreak has totaled more than 340 suspected cases this year, and "this is not acceptable." She said the outbreak came about "mainly because of people who have denied their children vaccination." The Herald on Tuesday reported the 22 victims had not been vaccinated, quoting health officials in the troubled country. Ninety cases have been confirmed nationwide, Zimbabwe's Health and Child Welfare Minister Henry Madzorera told the newspaper. "This is an unwarranted loss of lives given the fact that measles is a preventable disease," he said, according to the state-owned Herald. "In Zimbabwe, outbreaks of measles were rare because of sustained high vaccination coverage among all children. It is therefore important for parents to realize that vaccinating their children protects the individual children" from the disease and its complications," he said. The outbreak has hit five districts in Zimbabwe, Madzorera said. It is likely to further strain Zimbabwe's health system, which last year linked nearly 5,000 deaths to a cholera epidemic. In the past three months, five people have died from cholera, but the WHO said the situation will not be as bad as last year.